Near my house there are two well-worn dirt paths through the grass. The first cuts just a dozen feet from one sidewalk to another, and the second travels down a small slope to meet up with an asphalt park trail below. I live in a master planned community, where the roads, trails and sidewalks are meticulously designed and maintained to direct travelers along a predetermined route. Yet the people who take those dirt paths have a different idea. Anywhere you walk, you can almost always find these bare dirt paths leading away from the pavement. They may be a few feet long or hundreds of feet, but enough people have taken this same unofficial route that it has become an obvious option – the proverbial road less traveled. 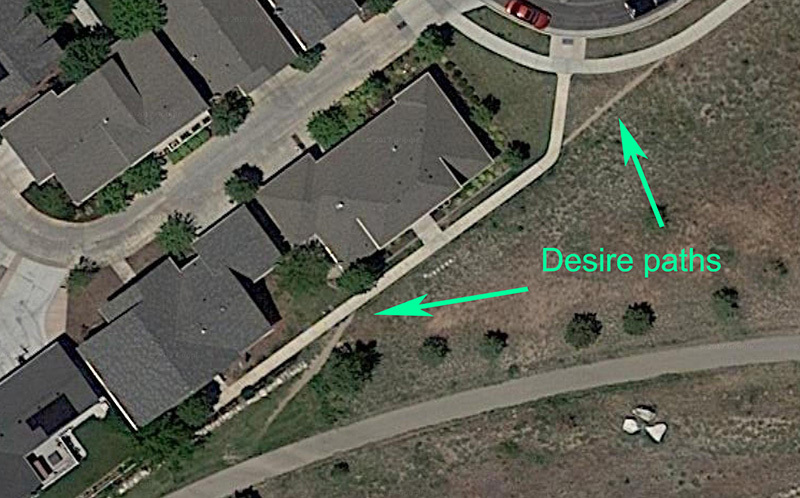 We often just call these shortcuts – and indeed Wikipedia suggests they are often “the shortest or most easily navigated route between an origin and destination” – but they have an official name in the urban planning lexicon: Desire paths. 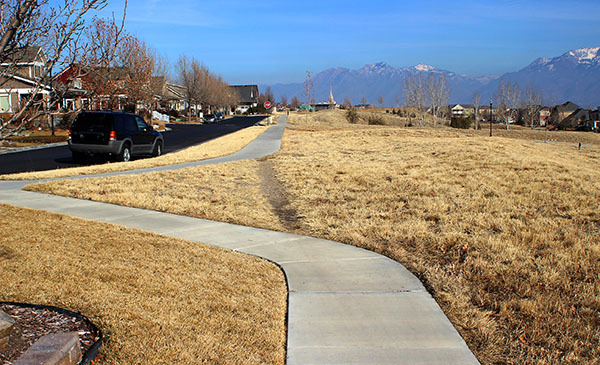 Desire paths are not created by design; rather, they are the natural result of people who look around and see a better way to get where they’re going. Over time, as these trailblazers prove this new route’s success, the path becomes visible even to those who wouldn’t naturally think to take it. Now they can see there is another way, and they can choose to follow it or stick with the more conventional path. I heard about desire paths on the 99% Invisible podcast and was immediately smitten with the name and concept. The phenomenon originates in urban planning, but it also crosses into technology. Twitter’s hashtags and @ mentions were not functions created by Twitter’s developers, but rather conventions it adopted after seeing how its users were communicating with one another. It’s also a perfect metaphor for the FIRE movement. 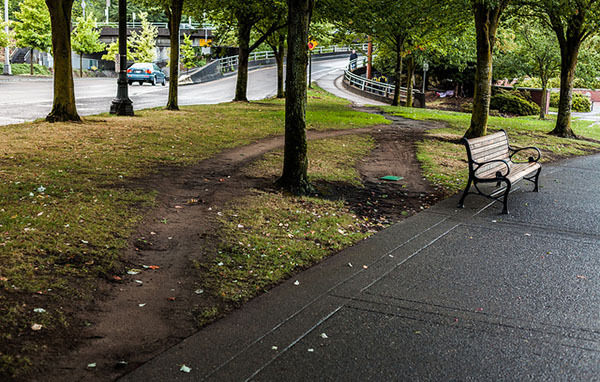 What we’re seeing now with the proliferation of personal finance blogs and podcasts that have a financial independence and early retirement theme is a digital desire path. Enough trailblazers have proven there’s a faster way to get where they are going – a shortcut to retirement – and we can choose whether to break from the expected path and follow their lead. Is that the right choice for everyone, however? Of course not. Perhaps the most famous desire path in the U.S. is the Oregon Trail. From 1840-1880, nearly 400,000 people loaded up wagons and headed west to a brave new world. So obvious was the success of The Oregon Trail, along with other similar trails, that it became a more permanent path that future travelers would take as riders on the Transcontinental Railroad. He talks about the early pioneers whose footsteps today’s FI seekers walk in. People like Amy Dacyczyn, Vicki Robin, Joe Dominguez, Jacob Lund Fisker, and those posting on early-retirement.org. Their contributions in the form of “The Tightwad Gazette,” “Your Money or Your Life” and Early Retirement Extreme were the original waypoints along the trail where travelers could stop to rest and commiserate. They inspired others to keep going. Later travelers of The Oregon Trail created alternate routes from the original path to shorten the trail or to get around obstacles. These “cut-offs” would themselves become established options for those who came behind them. In the FIRE community, people like The Mad Fientist guide people in tax optimization and Roth conversion ladders – laying out cut-offs for financial obstacles others just accept as part of the journey. Many of the voices in the personal finance community are software engineers and entrepreneurs – people whose nature is to create something from nothing. Such was the constitution of the pioneer stock, who were undeterred by what was because they saw what could be. The FIRE writers, bloggers, podcasters, and forum members are the equivalent of the Transcontinental Railroad. They offer a proven, relatively safe, way to reach an endpoint at a speed once thought impossible. Big names like Mr. Money Mustache help spread the word and get curious people thinking about what such a trip might be like. His “The Shockingly Simple Math Behind Early Retirement” article is essentially a railway fare board, showing people the price of a ticket to freedom and a life they currently only dream about. But, of course, there are many vehicles and routes to financial independence. Not every path suits every person or every situation. We may share many of the same predictable, paved roads along the way. But each of us has a chance to pick up our head, look around, and decide which way we’ll go. For some, that rock-solid sidewalk with its well-defined edges and overhead lighting is soothing and secure. For others, the allure of a well-worn path and a little adventure is a chance too hard to pass up. And then there are still those who envision an entirely new way to their dream destination, whose desire to create one may someday inspire others to follow. I Dream of FIRE is written by a late 30’s married father of two college-age stepsons and a 5-year-old daughter. With one foot in each end of parenthood, he explores the financial realities and challenges of seeking financial independence with kids at either end of the spectrum. Some of his popular posts include The Highly Effective Money Management Matrix, Coming to Terms With All The Debt I Never Thought We Had, and Don’t Compare Your Middle to Someone Else’s Beginning. Is It Time For a “Depth” Year?